1818 Entire addressed to Biddenden with, on the front, a TENTERDEN/60 mileage, KT 1176. 1851 1d Pink envelope to London showing a very fine ST MARGARETS BANK (under Rochester) undated circle in Blue. 1773 Entire from Lisbon addressed to London, sent "Pr the Yorick/Capt. Steel/Q.D.C." (whom God preserve) and showing a very fine DOVER/SHIP LRE, Robs S 1a. 1825 Cover to Brighton showing a very fine step-framed DEAL/SHIP LETTER, Robs S 8. 1845 Cover and large part letter to London showing a very fine boxed NEW ROMNEY/SHIP LETTER, Robs S5. 1903 1d Brown NEWSPAPER WRAPPER franked by additional ½d, SG 213 and 3d, SG 232 addressed to "GOLD COAST, W. AFRICA" and tied by ASHFORD/KENT circular datestamps, total 4½d. AN EXCEPTIONAL DESTINATION. 1845 Entire forwarded by "NATHAN.BROS/* RIO DE JANEIRO *" to London per "Isabella" showing a DEAL/SHIP LETTER, Robs S8a in black. 1848 Entire from Dover to Baltinglass, Ireland showing a FINE CHARLTON (Dover) UNDATED CIRCLE on the reverse. 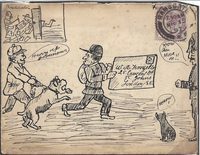 1820 Entire from KINGSTON, JAMAICA addressed to Edinburgh showing a very fine DEAL/SHIP LETTER, Robs S 8, MS "Paid 1 N 2". 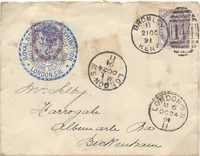 1893 2½d Blue, SG 157, Plate 22, tied to envelope from London to Vienna showing a very fine DOVER.TO.LONDON/FDM circular datestamp, Code C, W 486. 1841 Bill of Exchange Entire from Fort William, Calcutta to London "Per Hotspur" and redirected to Edinburgh, showing a very fine boxed NEW ROMNEY/INDIA LETTER, Robs IN.3, in black. 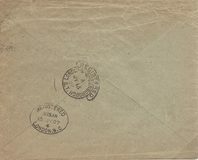 1873 Registered Envelope to London franked by a 1d Rose-Red, SG 43, Plate 166 and a 4d Dull Vermilion, SG 93, Plate 13 and tied by fine MARGATE 506 numerals. 1806 Cover from (in pencil) NEW PROVIDENCE to London "Pr Thames" showing a fine oval SHIP LETTER/crown/DOVER, Robs S8. 1840 1d BLACK, SG 2, PLATE 5, F-H. A very fine four-margin example tied to entire to TENTERDEN by a VERY FINE LONDON MALTESE CROSS IN RED. 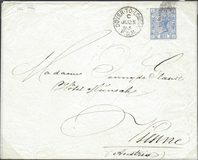 1850 Cover forwarded from Rio de Janeiro by "John Gasser", Scarcity 4, to London "Pr Troy" showing a very fine DEAL/SHIP LETTER, Robs S8a, in BLUE. 1825 Entire from PARIS to LONDON showing a DOVER/SHIP LETTER, Robs S9.